Viewpoint Tickets - Best prices on Rockies tickets, Baseball tickets and MLB All Star tickets. Location: Main entrance is on Eliot Street. Left field (E), Clay St.; 3rd base (N), 20th Ave.; 1st base (W), Eliot Street; Right field (S), 17th Ave.
Dimensions: Left field: 335 feet; center field: 423 feet; right-center field: 400 feet; right field: 375 feet. Fences: Left field: 12 feet; center field: 30 feet; right field: 14 feet. Professional baseball found its way to Denver in 1947, when the Howsam family founded the Class AAA Denver Bears and built Bears Stadium. The team was so popular that additional seating capacity was added in 1959. In 1968, a non-profit group expanded and rededicated the Bears' home as Mile High Stadium. By 1985, a then-minor league affiliate of the Cincinnati Reds arrived in Denver. 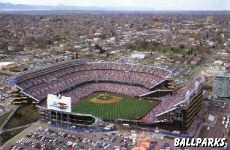 Finally, in 1993, the Colorado Rockies became Denver's first Major League Baseball team, playing their games at Mile High Stadium. 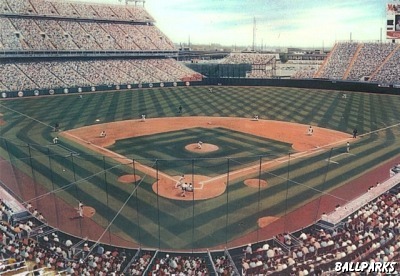 The team moved into their brand new home, Coors Field, in 1995. Mile High Stadium was the home of the NFL Denver Broncos until December 2000. When both football and baseball games were played there, the stadium had to be transformed to accomodate the respective sport. To convert the football field into a baseball diamond and back into a football field, the entire east stands (three tiers containing 21,000 seats) floated out to left field on a cushion of water, transforming a 100-yard football field into an asymmetrical baseball field. Inside Mile High Stadium by Munsey & Suppes. Aerial view of Mile High Stadium by Munsey & Suppes. Tickets to Colorado Rockies, NCAA Basketball Tournament, College Football Bowl, NCAA Football, Denver Broncos, Paul McCartney and Wicked Denver provided by Ticket Triangle.